Hello, hello! Happy Memorial Day, everyone! Hopefully you have the day off work to drink your face off and eat til you puke honor those we've lost in battle and spend time with your loved ones. Oh, and also to celebrate the official start of summer, get some pool time, and bring your white pants out of storage. Yay, societal norms! I'm popping in today with a quick recipe for the most bangin' salsa in town. Seriously, one bite of this at your block's Memorial Day barbecue and your nosy neighbors with the strangely quiet kids named Kaylen & Kylen will be banging down your door for the recipe. (Pro tip: do not open the door; move as quickly as possible and never look back). And, on top of that, it's easy! So, with that said, we'll move right into it. Enjoy, friends! This salsa is, like most, super simple! 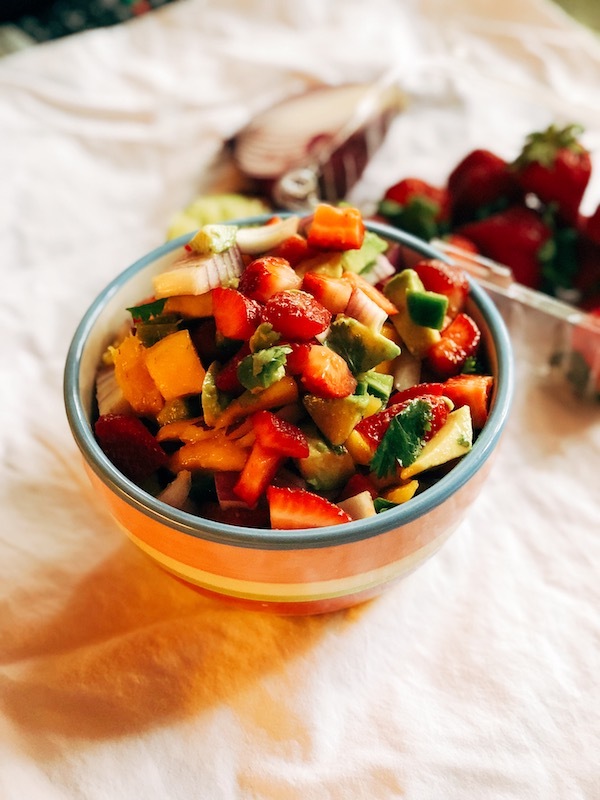 All you need to do is dice up your red onion, strawberries, avocado, mango and jalapeño and add to a large bowl. Remove the leaves from your cilantro, chop, and add those leaves to the mixture (no stems!). Finally, halve the lime and squeeze the juice from both halves into the mixture, then toss to combine. That's all! You can eat it right away (it's very hard to stay away from), but you'll get the best results if you let the mixture set for a while so that the flavors can combine. This salsa can be scooped up with chips, used as a topping on grilled chicken or other meats, or - honestly - eaten with a spoon. No judgment. Do ya thang, boo, it's summer! I hope you enjoy, and have a fabulous Memorial Day! Tell me - what are your plans for the long weekend? I'm playing it by ear and relishing my time at home after traveling so much for the long weekend, and heading to a friend's house to watch the premiere of the new season of The Bachelorette!